I mean, I love it stokes the fire under some people to do some fun & romantic things - & I also know that should happen all throughout the year, not just on one day. But it's fun to have a day dedicated to love, isn't it? I also know what it's like to feel left out on Valentine's Day. I was always that teenager in school that when they handed out flowers or candy or whatever some club was selling at school, everyone all around me were getting lockers full of symbols of affection from others. At such a pivotal age, that kind of thing sets in like, "you're not good enough"
& then you move to the age of young adult where it only gets worse. If you're not getting flowers at work, or candy delivered, or you dont have a date on Valentine's Day.... wow, the struggle it can wear down on your heart. It's funny though because I do remember, even being in school, I may have not had those deliveries given to me at school, but I always knew when I got home, I'd have a reminder of being loved on Valentine's Day. See, my dad was always so good at bringing home something for me. Usually a box of candy - big or small - didn't matter. It was always just something there to know he loved me. 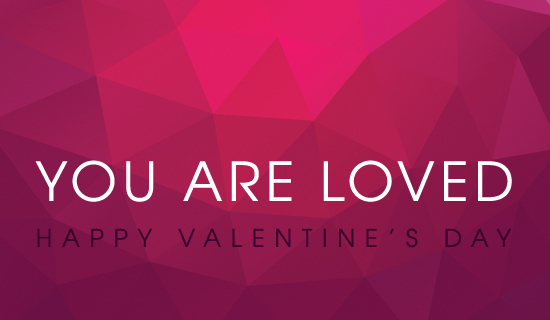 It just made me think on my drive in today, if you are struggling with Valentine's Day - I want you to know you are loved. Your Heavenly Father is right there every day, especially today, to let you know you are His child... He loves you so dearly.... don't ever forget that. 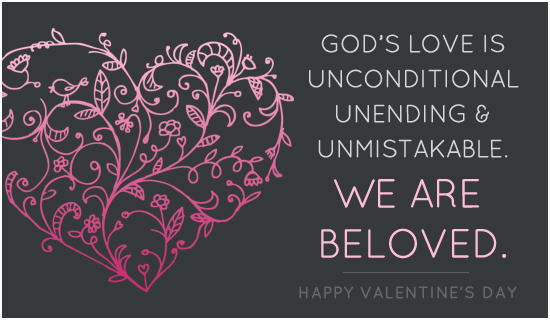 I think it's so easy to feel the comparison thing especially on days like valentine's Day - but I just wanted to plant that reminder that God's love in so incomparable to anything else in your world. Nothing else could ever match up... even carnations passed out in 10th grade home room. I know I am blessed to have love shown to me through my parents my whole life & then meeting my love & having him be so gracious & sweet on Valentine's Day himself year after year.... but I do always remember, even on those days where it feels like you're so unlovable or unloved - you're not. You are always, forever, extremely adored by someone who cares for you more than you can imagine. Hope everyone has a great Valentine's Day - however that looks. Dinner with someone, pizza on a couch, flowers or no flowers, or just treating yourself (which I'm all in support of)... & if you need some kisses, come on over - I have a puppy who will love to kiss your face off. What a great post! As someone who works at a school, I ma seeing the hearts up on random lockers, and although I don't work in the high school part of the school anymore,I bet they are selling candy, hearts, flowers or something for a club like you mentioned (or maybe not). Regardless, although a nice gesture, I think that stuff should be banned at school because it could indeed make others feel inadequate. Every year I get my 6th graders a pack of valentine candy and put their name on it and have it on their desk when they come in (i'm so mean, I only do it for the 6th graders...haha. But I don't think the other grades know)! I know it's only a little something but I m reminded that for some kids, this may be the only little piece of appreciation they will get on this day. When we were in school, I remember our mom always giving us fun stuff that she ordered off her Avon Lady at work. They may have only been those fun little valentine chapsticks and some nail Polish, but we liked it! But I agree, we should show this love all year long, not just when the calendar says or when Hallmark wants to sell more cards! I say this about the Thanksgiving Holiday too! Have a good day friend! How sweet! Love this. My mom always had chocolate and a new book or cd waiting for me on Valentine’s morning. It made those awful middle school/high school days so much easier. What a beautiful post! This really resonates with me because I too was one of the girls always left out at school in not receiving roses or chocolates or whatever it was, and it always stinks to be left out. But knowing just as soon as I got home that my parents would do something special and make me feel loved always made everything okay. And of course having the love of a heavenly father means everything <3 Happy Wednesday, friend! This post is so on point! And I think you're perfect, Rebecca Jo! Happy Valentine's Day! Love this, Rebecca. I remember exchanging Valentine's as a child but weirdly my recollection of what kids did in high school is murky. People did not get "real" flowers from a flower shop but that's probably because my small town didn't have a flower shop. :D But there definitely can be a ton of pressure and I remember feeling badly when I was younger if I didn't have someone to celebrate with on Valentine's Day. Now that I'm older, it doesn't bother me so much. I still want to find my special guy because I want to share my life with someone, but I'm old enough where I have also made bad choices to not be alone and realize that being alone isn't all that bad. Plus Max. Happy Valentine's Day! We love 'cause He first loved us!! Happy Valentine's Day. Such a beautiful post!! Happy Valentine's Day! I love this message! What a great blog post to read this Valentine morning. Me: so can we just agree not to do Valentine's day cards this year? I remember feeling totally left out of Valentine's Day growing up in school. Now that I have Zoe, I am going to do something fun for her each holiday to let her know she is loved....and have her take something sweet to her friends to share that love and support. Chris and I both agree that Valentine's isn't our favorite. I make lasagna every year and we exchange cards, but we dont make it a big thing. He actually surprised me today and asked me to go to lunch with him which I enjoyed so much! I hope you have a wonderful Valentine's Day! Those puppies that will kiss our face off; they are a true gift from God. I think they're a reminder for me of God's love shown to us in SOOO many ways; as I've gotten older, at 24 years old, God has given me such a reassurance of His steadfast love that Valentine's Day has become an even more exciting joyful holiday to celebrate because we can always celebrate His unconditional awesome endless love shown to us through Jesus Christ dying on the cross and then rising again to give us HOPE in seeing Him again some day soon!!!!! <3 you and love this reminder Becca. Beautiful reminder, Rebecca Jo! I hope you had a very happy Valentine's Day! I love this! My mom always did something special and now we're doing things for her. It really is such a great reminder to show the people you care about a little extra love just like Jesus shows us He loves us everyday. You are so caring. This is a lovely post. I have the same feelings about Valentine's Day. We didn't do anything big. We just gave the girls some gifts, went out for pizza and I gave Rory a card and a bag of candy. You should express your love everyday. I did see a meme that said something like you definitely know your relationship status on Valentine's Day and how it is shoved in your face.